WRAPS DIGITAL GRAPHICS shows are a great resource. These expos are intended for graphics manufactur- ers, installers and sign makers—both small and large. Walking the floor at trade shows is a great way to learn about the capabilities of new printers, profiles, laminators, finishing, tools, etc., for any budget." What skills do you need to master? Walton says that technical colleges offer great desktop publishing and digi- tal design classes. 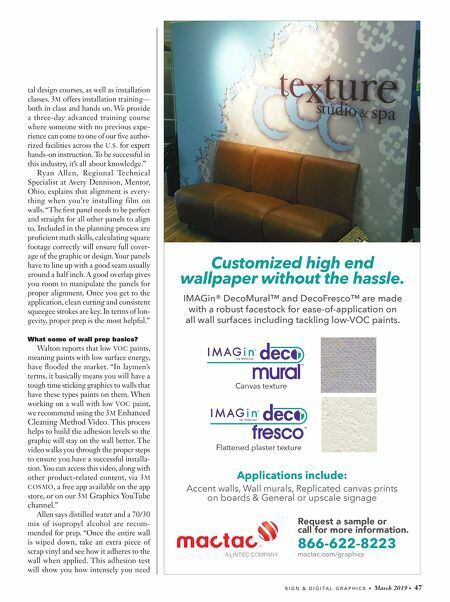 "Right now, there is great demand in the industry for talented designers and installers. Anyone starting in this field should consider taking digi- 46 • March 2019 • S I G N & D I G I T A L G R A P H I C S ISA tradeshow graphics printed on Avery Dennison MPI 2600 textured wall film. (Image courtesy of Avery Dennison) Wall graphics printed on Arlon DPF 6700 and wrapped by Superior Sign & Graphics. (Image Courtesy of Superior Signs & Graphics and Arlon Graphics) Joe Walton of 3M says choosing the correct film depends on how long the customer wants the film to stay on. 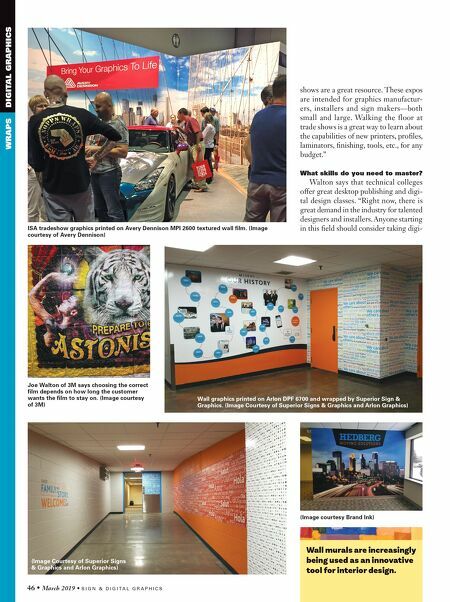 (Image courtesy of 3M) (Image Courtesy of Superior Signs & Graphics and Arlon Graphics) (Image courtesy Brand Ink) Wall murals are increasingly being used as an innovative tool for interior design.